To be used specifically for private use, not commercial, Mysafetravel provides free access to the latest information from global travel security experts that will help you and your family stay more vigilant when travelling. Meanwhile, in the event of an emergency, family and friends back home can rest assure they will be immediately notified as soon as travellers utilise our check-in safety feature. Travel in a foreign country presents a host of new challenges in an unfamiliar security environment. Through our partner Riskline, a leading travel risk intelligence firm in the security sector, Mysafetravel offers free access to information normally only accessible to large corporations. 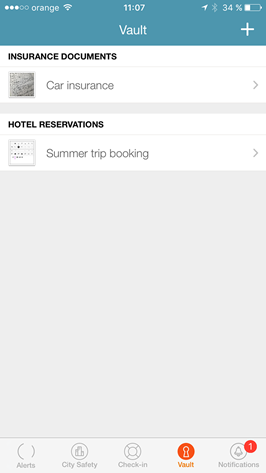 Our App, designed exclusively for the global leisure traveller, has now changed that. 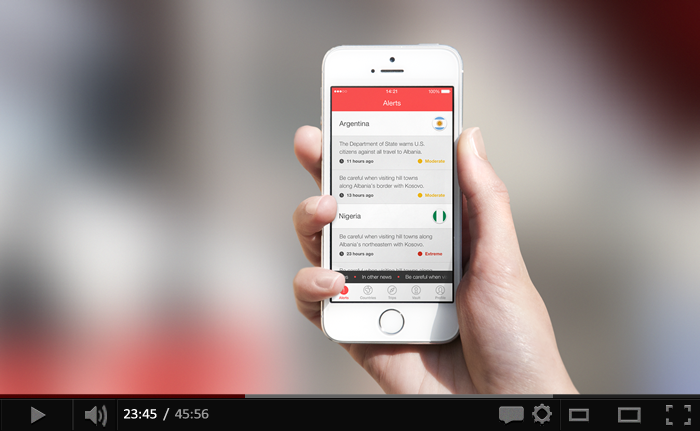 The award-winning alert service provides leisure travellers with free 24/7 updates on travel risks in over 220 countries, anytime, anywhere – sent directly to your mobile device. 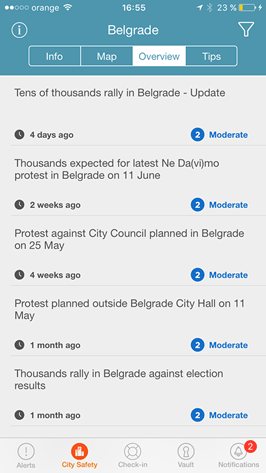 Full alerts include a detailed overview of the incident, its precise location and traveller-focused advice on how to stay safe or keep travel plans on track. City Safety Reports offer essential guidance to navigate city-specific threats to travel safely as soon as you arrive at your destination. 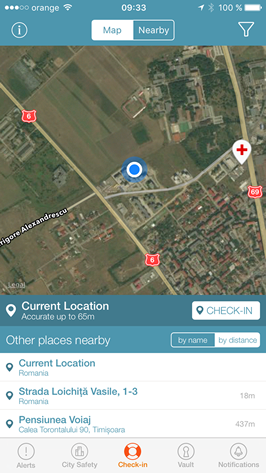 Reassure your loved ones of your well-being by checking in at nearby locations. Once you've checked in, your emergency contacts will receive a note, giving them peace of mind. The vault can store photos of important documents or items. Vault items are stored locally on your device with strong encryption and cannot be accessed when the device is locked. To keep them safe, make sure you have a Passcode on your device. 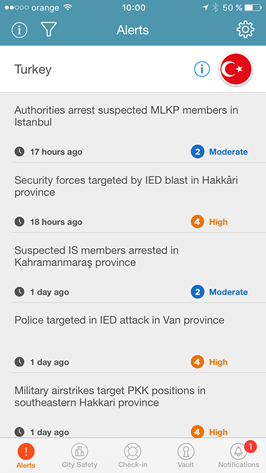 Always stay updated and never miss an important event with our real-time push notifications. 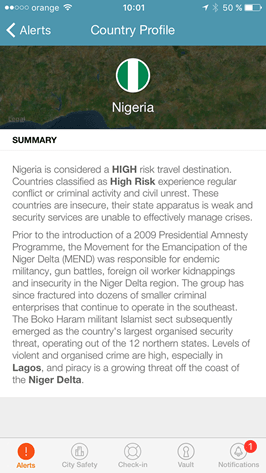 The Country Profile presents a country risk rating and brief security overview of a specific country, and may cover topics related to political instability, terrorism, crime, health and personal safety. 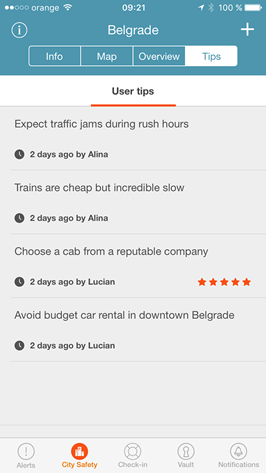 Select to tailor which alerts and/or user tips appear on the map. 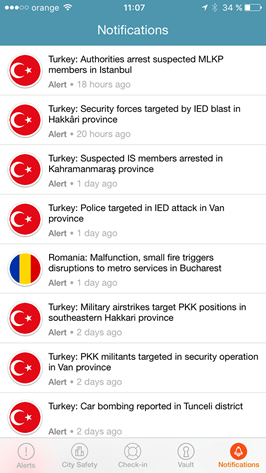 Filter out which sites - embassies, hospitals, police, pharmacies, airports, offices - appear on the map. 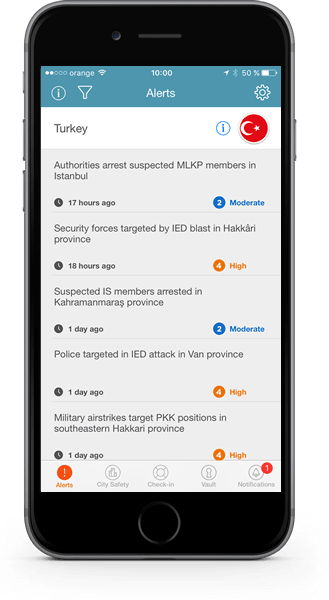 MySafeTravel App provides access to the latest information from global travel security experts that will help you and your family stay more vigilant when travelling. 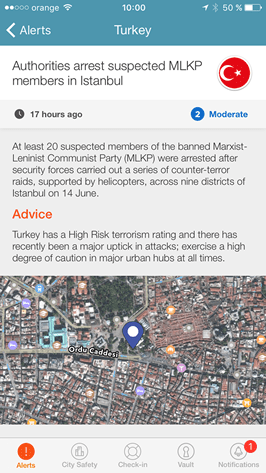 Through our partner Riskline.com, a leading global consulting firm in the travel security sector, mySafeTravel App offers access to information once only accessible to business travellers. The white-label version will allow individual companies to tailor the app to suit their own needs and those of their clients. Mysafetravel ApS (We) are committed to protecting and respecting your privacy. 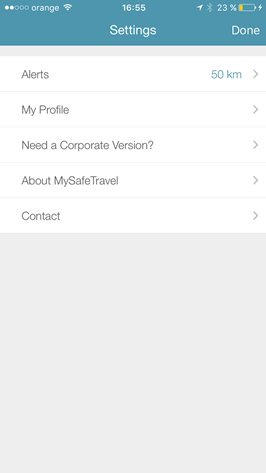 MySafeTravel mobile application software (App) hosted on Apple App Store/Google App Store (App Site), once you have downloaded or streamed a copy of the App onto your mobile telephone or handheld device (Device). For the purpose of the Danish Act on Processing Data (in Danish: “Persondataloven”) (the Act), as amended from time to time, or similar legislation the data controller is Mysafetravel ApS, Lidemarksvej 57, DK-4681 Herfølge, Denmark. 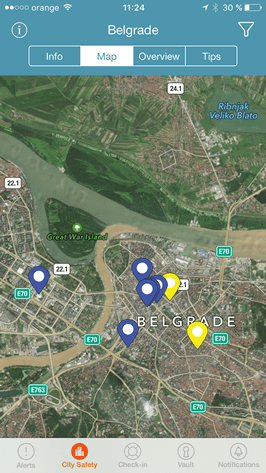 Location information. We may also use GPS technology to determine your current location. 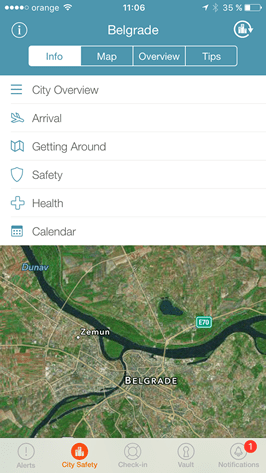 Some of our location-enabled Services require your personal data for the feature to work. If you wish to use the particular feature, you will be asked to consent to your data being used for this purpose. You can withdraw your consent at any time by disabling this feature. We may disclose your personal information to any member of our group, which means our subsidiaries, our ultimate parent company and its subsidiaries, as defined in section 5 of the Danish Companies Act (in Danish: “Selskabsloven”), as amended from time to time. If Mysafetravel ApS or substantially all of its assets are acquired by a third party, in which case personal data held by it about its customers will be one of the transferred assets. protect the rights, property or safety of Mysafetravel ApS our customers, or others. This includes exchanging information with other companies and organisations for the purposes of fraud protection and credit risk reduction. All information you provide to us is stored on our secure servers. Any payment transactions carried out by us or our chosen third-party provider of payment processing services will be encrypted [using SSL technology OR [ALTERNATIVE ENCRYPTION TECHNOLOGY USED]]. Where We have given you (or where you have chosen) a password that enables you to access certain parts of Our Sites, you are responsible for keeping this password confidential. We ask you not to share a password with anyone. We may collect and store personal data on your Device using [application data caches and browser web storage and other technology. The Act gives you the right to access information held about you. Your right of access can be exercised in accordance with that Act.